Whether you only have a few hours on a busy trip to Provence, or you have multiple days to devote, we’ve got you covered. Our guided rides are designed to let you experience the best of what the south of France has to offer, all in a morning ride. If you want something more ‘epic’ then it doesn’t get much better than a climb of Mont Ventoux. More monumental? 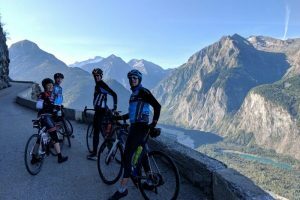 How about a Ventoux – Alpe d’Huez day trip?! All 44|5 Cycling Tours day rides are private and custom and tailored to your needs and fitness level. Join us in our backyard for a vehicle-supported ascent of mythic Mont Ventoux. Our Ventoux climbs are private and custom, so you can simply choose the date that works best for you. If you happen to be in Provence and are looking for a ‘cycling fix’, drop us a line and we’ll we’ll show you some of our favorite roads. We can do rides from Montpellier, Nimes, Avignon, the Mont Vetnoux area and the Luberon Valley. The most epic climbing day you could imagine – ride both Mont Ventoux and Alpe d’Huez and still get home for dinner! These custom one-day tours begin and end in Provence.